100% compatible. No issues & no worries.! Quick order processing. Fast shipping. Nice! Fiber Media Converters are simple networking media conversion devices to connect two dissimilar media types, including fiber-to-copper and fiber-to-fiber. Fiber-to-Copper Media Converter integrates fiber into a copper infrastructure and make it possible to migrate a local network to fiber while extending the productive life of existing infrastructure. Fiber-to-Fiber Media Converter connects different fiber optic networks and support conversion from one wavelength to another. They can provide connectivity between multi-mode and single-mode fiber, as well as between dual fiber and single fiber. 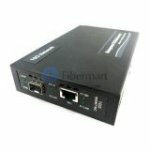 Fiber-Mart provides a large selection of fiber media converters for Ethernet, Fast Ethernet, Gigabit Ethernet, 10-Gigabit Ethernet, Data Communications. 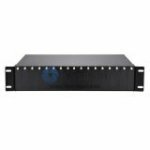 In addition, we also provide Media Converter Chassis.